What year is that . I had a 66 . I love the way the front cap tilted up . You could get to everything on engine , much easier than mg midget. I have an MGB built in '96 but registered as a '67. 215 CI/3.5 Liters. Can I play? If not, I have a stock '73 MGB. Fellow Brit car masochist? I have loved that car (Spitfire) since I was a kid. Classic. I had a red 1974. Fun car but a little small for me. I'm 6'3 and my friend is the same size. We looked like a couple of gorillas when we drove around together. I’ve always thought the Spitfire was very pretty. I had a 68 MGB that I loved. Do you have a can of Lucas replacement wire smoke? I bought mine new in 1967 when I got out of the service. I saw a restored one awhile back but I don’t think I could get in our out if I had to. I've had a number of Brit cars, MG, AH, Morris, Hillman Husky..... My dad had a MGTD I learned to drive on. Never had a Triumph Spitfire, so when I saw this I had to have it. It's fairly well sorted. Another summer toy. Lucas - The Prince of darkness. Lucas did not invent darkness but he DID perfect it. I like the spitfire but would love to have a TR6. 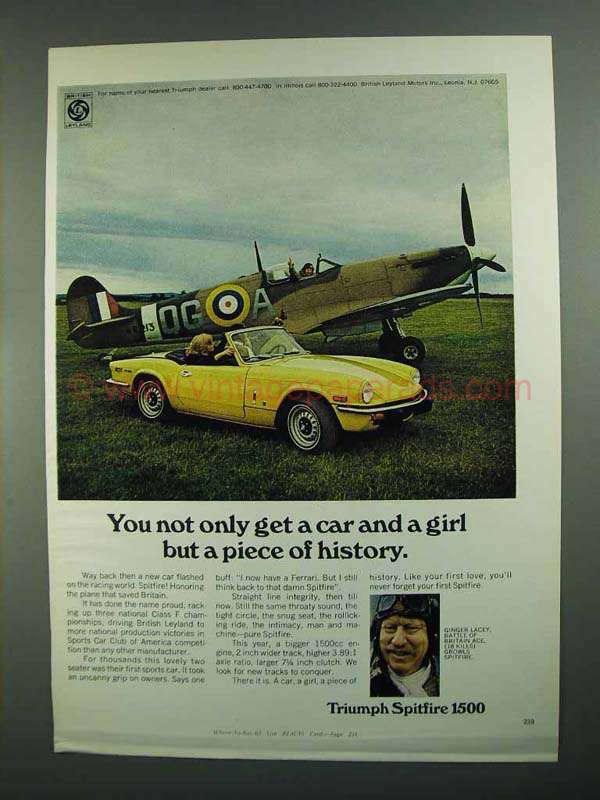 I remember in the early 70's an add that had a spitfire (car) parked next to a real spitfire (fighter), awesome.